Buy paper viewing glasses instead of the plastic ones. Not only will they protect your eyes, paper viewing glasses are 100% recyclable in your Blue Bin while the plastic ones are not. If you do spring for plastic (they’re a bit more expensive), keep them as souvenirs instead of throwing them in the trash. Click here for some good paper options. There are so many great locations for viewing the eclipse. If you’re traveling to a prime spot, make sure to carpool with your neighbors, friends and family. Click here for a comprehensive eclipse event guide. Whether you’re viewing at home or joining others at a party, food and drinks will probably be involved. Make sure to choose reusable plates, cups, bottles and cutlery to reduce waste. If you’re in charge of bringing food and drinks, choose items in recyclable packaging so you can toss everything in your Blue Bin when the party’s over. Check out our Recycling 101 flyer to find out what goes in your Blue Bin. Better yet, print and post this accepted materials signage by your recycling containers so party-goers know what they should and shouldn’t recycle. If you’re watching at a planned event, help the organizers by picking up after yourselves and recycling e verything you can. 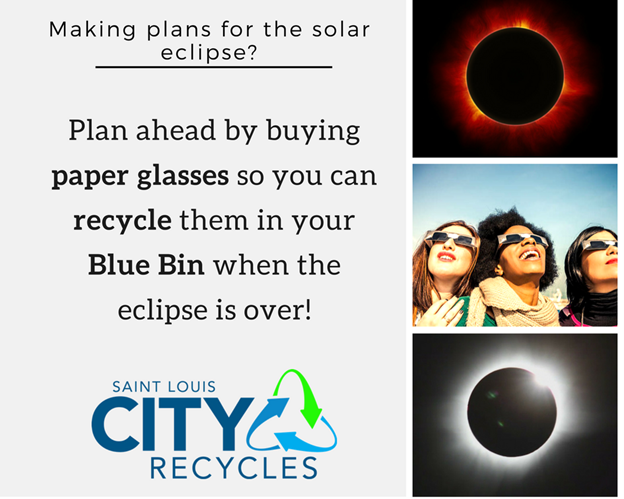 The eclipse is short lived, but trash that sits in a landfill or litters our environment can have negative effects forever. Looking for a fun activity to do with your kids that combines reuse and the solar eclipse? 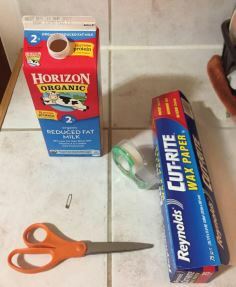 Click here to find instructions for how to make a viewing camera out of empty cartons! ← Take the ‘Plastic Free July’ Challenge Anytime!